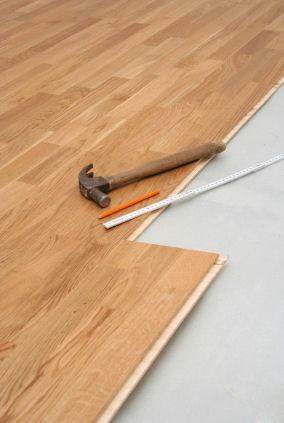 Installing a laminate floor is not that difficult for a handy person. It doesn't take an experienced handyman to learn how to install a laminate floor. Depending upon the size of your room, you may be able to complete this project in one day. Laminate flooring remains a popular floor choice among builders and homeowners. Why? It's simple. It's easier to clean than carpet. It is very economical, especially in comparison with hardwood or ceramic flooring. It comes in a variety of styles and colors to fit virtually any home décor. Laminate is easy to work with. You won't need any expensive or tricky tools to use with this type of flooring. Laminate flooring now gives homeowners a multitude of options. No longer are consumers stuck with only choosing sheets of laminate that must be rolled onto the floor. While this is still a popular option, there are many other user friendly laminate floor products. Laminate Tiles: These tiles can be as small as 6x6 or as large as 24x24. Many styles are so beautiful that it can be hard to tell the difference between laminate and ceramic. Wood Laminate: Wood laminate is another popular and affordable option that homeowners choose when they want the look but not the expense of installing a wood floor. Laminate Rolls: This is probably the most economical type of laminate flooring. You can purchase rolls of flooring to fit any area of your home. Become familiar with laminate floor ratings before you purchase your floor. The floor you choose will dictate how to install a laminate floor. There are actually peel and stick laminate floor options. These are typically sold as floor tiles. You simply peel off the backing and apply the tiles. You can actually apply these tiles to your old vinyl flooring if you choose. Before you disregard this type of flooring, visit a building supply store, such as Lowes and check out their beautiful laminate floor tile choices! Some wood laminate is peel and stick as well. Others actually create what is referred to as a floating floor. Using a tongue and groove system, you can actually install the floor on top of your old floor as long as that flooring is even and smooth. The tongue and groove system ensures that your floor fits tightly together. Depending upon the floor or subflooring you already have, you may need to purchase an underlayment pad. Ask your local flooring expert at the store where you purchase your flooring materials if an underlayment pad is necessary. Sheets are typically put down using a glue or adhesive manufactured specifically for that flooring. You may able to install the flooring directly on your old floor, or you may need to remove the flooring before you begin. While the installment method may differ somewhat depending upon the floor, the following is a general guideline for the supplies needed and the steps for installing. Pull up any baseboards. If you do this carefully, you should be able to use them again. Pull up any old flooring, especially carpeting and padding, and remove any glue, nails, and any other residue left behind. Sweep and clean the subflooring surface until it is free from any residue or debris. Measure the square footage of the floor by measuring across both sides of the room and multiplying those two numbers. Because you'll have to cut some pieces, you'll need to purchase an additional five percent more flooring and padding than the square footage of the room. Measure and cut your underlayment pad to fit the room. Attach the pieces with the clear tape. For sheets of laminate, you'll need to roll out the flooring and cut to fit. For tongue and groove wood pieces, you should stagger the joints where the pieces fit to create a wood floor look. As you connect each piece to another, use the rubber mallet to tap the pieces together snugly. For doorways, you may want to add a few drops of wood glue to ensure a solid fit. For laminate tiles, peel and stick the tiles snugly against each other. Measure and cut those tiles that need to be custom-fitted before you peel off the backing. For doorways and offset edges, you'll need to use a sharp utility knife or coping saw to cut the pieces to fit. Once you've completed the floor, you can reinstall the baseboards, sweep, and enjoy!